Will millennials ruin NFL football? 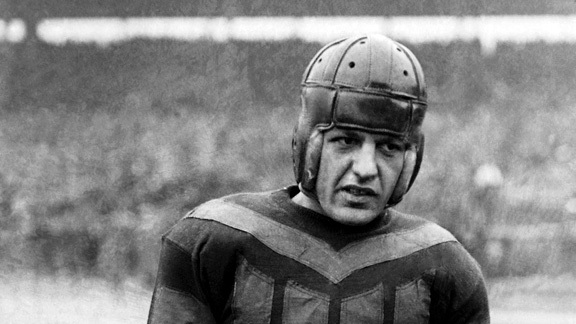 I bet most millennials don’t recognize Red Grange. It’s a bit of a game that we older folks play. We blame millennials for ruining things. We say, thanks to them it’s impossible to find a good sit-down restaurant, it’s because of them the housing market isn’t what it should be, it’s because of them that wearing brown shoes with black pants is somehow acceptable. We tend to forget that we as their parents and elders are the ones who made it acceeptable for them to put barn doors inside their houses and grow ironic moustaches and build iPads into milk crates. We made them who they are today. And who they are today just might mean the end of NFL football. Not today, but eventually. Sure, there’s been controversy lately, but that won’t end the NFL. Our opinions won’t kill the NFL today, but our kids’ opinions might. You see, we didn’t want our kids to play football. Football causes concussions and broken bones and more than anything it’s a “boy thing.” We wanted our daughters to feel empowered too. We also wanted them to get through school without being disfigured in any way. So we put our kids in soccer, which can be a pretty rough sport but usually isn’t, at least when the younger kids play it. Worst case scenario you take a ball to the face and even that implies that the kid is good enough to actually be where the ball is. Fair enough, most of our kids weren’t. So while our kids may have grown up watching us watch football, they didn’t grow up playing it. So, they just don’t have a real understanding of the game in quite the same way. And that could be disastrous for football teams and all the companies that profit from them. One of those companies: DIRECTV. DIRECTV’s NFL Sunday Ticket is not only the costliest sports package of any pay-TV provider, it’s also the most profitable. It’s so important to the bottom line that AT&T wouldn’t buy DIRECTV until there was a guarantee that the NFL would stay with them exclusively. Now, before you go complaining about DIRECTV getting rich off the little guy you ought to know that the big profits come not from personal subscriptions but from sports bars. NFL Sunday Ticket costs you about $300 but it can cost bars and restaurants up to $10,000 because of rules that base public viewing on how many people can fit in a room. DIRECTV may be sticking it to sports bars (spoiler alert: they aren’t, sports bars make money showing NFL games) but they’re being fair to the little guy. Of course, that whole “Football is king” attitude may change in the next decade if millennials don’t start watching as much football as their parents and if they don’t let their own kids play football. It’s a violent sport to be sure, and you often hear stories about kids whose lives are changed for the worse because if it. High school football programs are struggling because parents just don’t want to take that kind of risk with their kids, and I kind of don’t blame them. So no high-school football means no college football, which means, eventually, the NFL can’t find enough players, the fans aren’t as interested, and the whole thing implodes. Good thing that’s years away, but I do have to say that perhaps it is time to rethink the huge cost of football for everyone, and to do it slowly so that you don’t see this big economic impact in areas where pro sports contributes just as much as it takes. There will be plenty of time to rebuild other profit centers, it’s just something that people might want to think about today, that’s all.